Utilizing railroads for mass transit systems may become necessary in the next century. Why not preserve the existing railroad corridors and avoid condemnation of private land for government projects? Once preserved, why not use these relatively flat, straight corridors for alternate transportation through bicycle commuting and recreational trails? These are not unique or radical ideas. Rail-trails efforts are active and successful throughout the country. 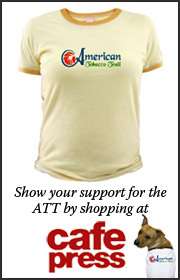 Currently, the TRTC is actively seeking volunteers and contributions. If you would like to help, or you want to know more, please join us today by completing a membership form or joining us in workdays with Friends of the ATT. The White Oak Greenway opening ceremony will be held at 2 pm on March 9th, 2019. This new greenway has been under construction for several years and the final sections were completed late in 2018. It connects with the ATT just north of the Wimberly Road parking area at ~mile 18.25. Give it a try, its all hard surface but has lots of boardwalks and is a bit different than the ATT. 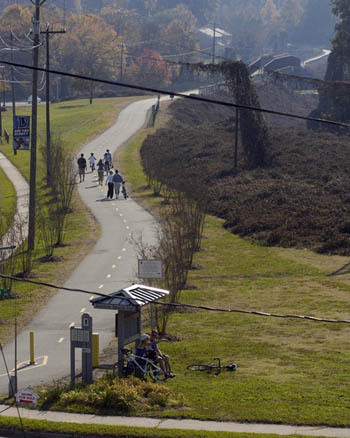 This greenway is 7.3 miles long and ends at Bond Park at High House Road. We have just posted updated maps of the ATT (see left hand sidebar) showing mile points, water access and other info for all three counties as well as connections for the nearby greenways in Durham. Among other changes, we added notes about the recently completed White Oak Creek trail which now connects with the ATT just north of the Wimberly Road parking area. Give it a try, its all hard surface but has lots of boardwalks and is a bit different than the ATT. As previously, our maps are in PDF format and can be printed. Hard copies of these maps are generally available at the trail kiosks at Scott-King Road, O'Kelly Chapel Road and by the rest room bulletin board at the New Hope Church Road trailhead. Copies are also available at the REI stores in Durham and Cary. TRTC has completed efforts to put in compliant parking and a new hard surface connector trail. Our efforts on this started in May 2017 with the clearing of a dozen trees and later efforts that year to install a 20' culvert and grind the stumps. The concrete connector is ~180' long, 8' wide where it meets the ATT, tapering to 5' wide for the rest of its length. The project includes one concrete parking space with an attached aisle that is ADA compliant for van and auto access by the handicapped and an expanded hard surface area around the fountain. When the State approved our plans to put in this trailhead in 2012 no requirements for ADA compliance were included but by 2017 we were notified that the State considers TRTC to be the "owners" of this lot since we had built it. We were able to build these improvements thanks to contributions from the Tobacco Road Marathon over several years and smaller donations from individual donors. We hope ATT users enjoy these improvements. Take a look at our 2018 End-of-Year Letter to catch up on what we have been doing on the ATT and Eagle Spur Trail.